The button I/O board (first picture) was built by Bret Victor and Peter Maresh. 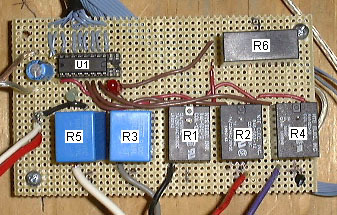 It used to be hooked up to an array of solid-state relays, but they didn't do their jobs properly, so that was replaced by the relay board (second picture), built by Bret Victor and Jeremy Boulton. The button I/O board allows the controller to read the current state of the buttons on the front of the Coke machine. The controller can also write to the board to switch the relays, which are hooked up to the Coke machinery that the buttons used to be hooked up to. This allows the controller to fake the Coke machine into thinking a button has been pressed. There are six relays because there are actually six soda stacks in the Coke machine which can be controlled independently. The button input and relay output used to be related, but they are now completely seperate (pressing a button does not affect the relays). There is no schematic, but the PAL code makes it clear what's going on. Read the button state from address 0. Only the low 5 bits are valid, and they are active high (1 means pressed). Read back the relay latch number from address 1. Set the relay latch by writing a binary number to any address. If the number is between 1 and 6, the appropriate relay is switched on. If the number is 0 or 7, all relays are off. The stuff you see in the lower-right of the button board is a simple audio amplifier which used to be used for one-bit audio output. This is not used anymore because (hopefully) the real audio board, with a DAC and LM386, will be built someday. The relays are hooked up in such a way as to mimic how the the buttons on the Coke machine were originally hooked up, with the common connection flowing from the NC (normally closed) terminal of one relay to the C (common) terminal of the next relay, which ensures that only one relay can be "active", no matter how many are switched.